Investing from abroad hasn’t been that challenging for me, especially since I made sure that before I left the USA to live in Panama, I had all of the tools necessary to conduct “business as usual”. (SIDE NOTE: if you want to see the tools that I am using to invest seamlessly in Panama, read my previous blog post titled 5 Essential Tools To Run Your Business While Traveling Internationally). Today, however, I want to tell you the story of 1529 Grove Street, one of our most recent flips. We actually acquired this property way back in January, but due to the red tape and bureaucracy of obtaining permits from the city of National City, CA, the renovation work was held up for 8 weeks. When we finally finished the project, we received a full price offer in only 2 days! Knowing that I was going to be in Panama at the scheduled date of closing, I closely paid attention to my responsibilities as a seller. One of these responsibilities was going to be that I would be required to sign a grant deed, on behalf of my company, transferring ownership from my company to the new buyer. Based on previously miserable experiences of dealing with Lawyers Title in San Diego (who won’t accept a foreign notary, only a US notary), we knew that we wouldn’t be using them for title work on this deal. I chatted with my escrow officer, and she suggested using Ticor Title. We contacted Ticor 3 weeks in advance of closing, and got written confirmation (in an email) that the document could be notarized by a notary in any country that is a member of the Hague convention; fortunately for me, Panama was a member in good standing, so everything looked great. I had my document notarized in Panama, and then sent it via Fedex to my escrow officer. Everything was all set for closing, until the day before we were set to close, we got an email from Ticor Title stating that the Grant Deed had been rejected. Being the action taker that I am, I immediately picked up the phone and called the person at Ticor who was killing the file. “Candy” at Ticor informed me that she was certain that the San Diego County Recorder’s office was going to reject the Panamanian notary. “No, we’re not rejecting it, but the county will” replied “Candy”. “Why don’t you just head to the US Embassy in Panama and get another deed notarized?” asked Candy. This was said in an incredulous tone, as if the Embassy was down the road like a local 7-11. “Why don’t we let the county make that decision rather than you kill the file yourself?” I asked. The last thing I needed at this point (the day before closing) was a title company looking to blow my deal up, rather than try and get it pushed through. We went ahead and just submitted the file with the Panamanian notary, and just as “Candy” had predicted, the county recorders office pulled the file, and deemed my deed as ineligible for recording. This now meant that our buyer was in limbo, technically not the owner of the property, and unable to move in. It also meant that my proceeds at closing (and therefore all of my profits) were being held by the escrow company! 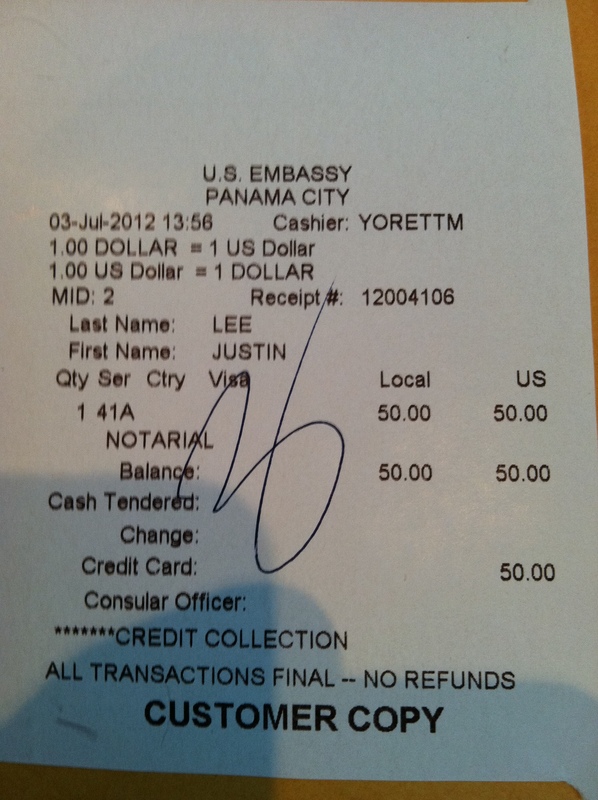 I was told that the file wouldn’t close, and we wouldn’t be paid, until the document was notarized in the US, or at the US Embassy in Panama City! I found this information out on Thursday, June 28th. Fortunately for me, I had a overnight trip planned to Panama City on Tuesday, July 3rd, as I had an early morning flight to Jamaica on Wednesday, July 4th for a friend’s wedding and my 40th birthday celebration. A month ago, I had the foresight to book an appointment at the US Embassy in Panama, just in case I needed to get a document notarized. When I landed in Panama City (after a 4 hour thunderstorm delay in Bocas Del Toro, the island in Panama where we live), I made it to the Embassy just in time for my appointment. The US government did notarize my document, although they did charge me $50, which is just slightly more expensive than my usual $10 at the local shipping store next to my old office in San Diego (or the freebie that I get when I go to my local escrow company in San Diego). Nonetheless, the document was notarized, and after an adventure with a cab driver, I made it to Fedex just before the cutoff time for the document to get shipped out that day, and arrive in the USA on July the 5th (as there was no delivery on the 4th due to the federal holiday). This story, however, might discourage some people from trying to invest from abroad, and to be honest, it really had me frazzled and frustrated. (SIDE NOTE: buying, fixing and flipping properties are probably the most advanced type of real estate transaction you can undertake, but they are also the most lucrative. If you’re a beginning investor and reading this post, and it’s scaring you, I would recommend that you start out with something much more simple, like wholesaling a property, or maybe try dabbling in “virtual wholesaling“). I was resigned to the fact that living abroad and needing documents notarized would require me to either find out exactly what the county or San Diego would accept (which would mean a trip to the recorders office, something not possible for me as I’m still in Panama), or setting aside the time, effort, energy and money to make a special trip to the US Embassy every time I was going to sell a property. This was extremely frustrating and annoying, until a friend of mine found out about a great solution to my problem. The solution allows me to get documents notarized by a US notary, no matter where in the world I am! I recently tested this solution, and it worked! Does that sound too good to be true? Getting documents notarized no matter where in the world you are? Well I’ve done it, and in my next blog post, I’m going to share with you the exact resource that I used, and how it works, and how you can do it as well. Make sure you get detailed instructions from your escrow officer as to what, if anything, you’ll need to have notarized to close the transaction. Make sure you know when the documents need to arrive, and if a Fedex is available, and how long (and how much) it will take to ship it back to the USA. Have a plan for how you can get your documents notarized that will be acceptable for your title company, and your local county recorder’s office. (NOTE: to ensure no problems, you’ll need a US notary- in my next blog post I’ll let you know EXACTLY how to this, no matter where in the world you are). I hope you enjoyed this blog post. If you have any questions about the notary process, or investing while living abroad, post them below, or connect with me on Facebook.